For all of his 30+ year career, Gene Wolf has been involved in some way with Information Systems. Whether it’s programming, systems analysis or system design Gene has done it. His other endeavors have included an eight year stint as host of a tech call in tech radio show in Syracuse, NY called “Random Access” and tech columnist for two years for a large daily newspaper. One of his claims to fame is he has actually touched the Hubble Space Telescope mirror. He was an IT manager for a Corning Glass facility in Canton, NY where the Hubble Space Telescope mirror was actually manufactured. Just recently he retired from a very stressful IT position and moved to the woods of Tennessee where he lives with two dogs, one and a half cats and a myriad of animals like deer, turkey, coyotes, and pumas that walk through his front yard. Gene, while new to the world of anthropomorphic writing, is a long time fan of anthropomorphics. Gene now writes full time, and most of his stories involve anthropomorphic characters and themes. He currently has a book successfully selling on Amazon titled Changes which is a collection of short stories, all in the anthro genre. 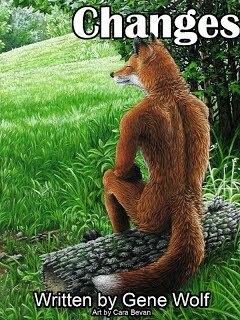 He also has two stories which will be appearing as podcasts for Anthro Dreams in the late winter of 2011 or early spring of 2012. His next book, another collection of short stories, is due out in late October or early November of 2011. Gene’s work has been influenced by old masters such as Robert Heinlein and Andre Norton and newer authors such as Jane Lindskold and Tanya Huff.